Google's Pixel 3 and Pixel 3 XL is leaking like flood. We have seen renders and real life images of the device but today we are bringing you something different. Today, we are bringing you the entire wallpaper collection from the yet unannounced smartphones and you can have it too. In this APK there are 28 wallpapers in total, and you can get all of them by hitting the download button below. If you want, you can just download just the ones that interest you but keep in mind the individual wallpapers will be static not live wallpaper. Click on the Google Drive link that we shared below to download the wallpapers and you need a phone running Android 9 Pie. 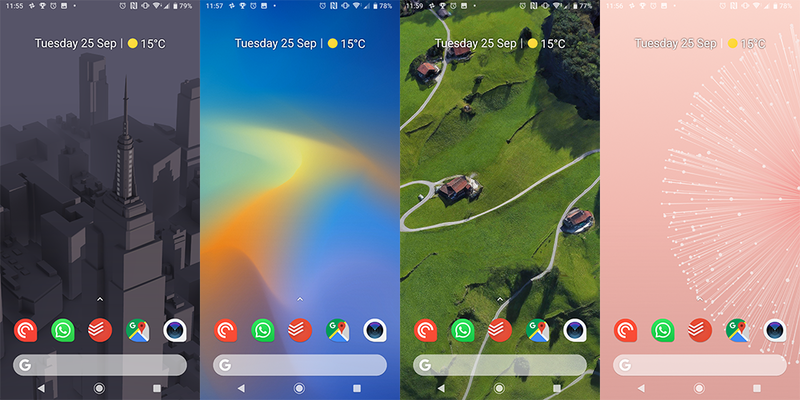 Install the APK file (com.breel.wallpapers18_9.apk) included in the Google Drive folder at the end of the article along with the Google Wallpapers app from the Play Store and you are good to go. The Pixel 3 and the Pixel 3 XL will be unveiled by Google on the 9th of October 2018. The phones have been leaked extensively over the past couple of months, and we now know most of the specifications of the devices. Both phones will be launched with Android 9 Pie, and use the Qualcomm Snapdragon 845 processor, 4GB RAM, and 64GB/128GB storage. While both phones have louder front-facing stereo speakers, none of them has a 3.5mm headphone jack. The Pixel 3 will come with a 5.5-inch display, while the Pixel 3 XL will feature a 6.2-inch display. Update: Due to the overload of traffic on this Google Drive folder, we are adding some alternative mirrors for you below.